Previously, I highlighted how I used social media. After reading recent posts by Dave Fleet and Social Media Explorer regarding the social media marketing ecosystem and measurement respectively, I wanted to expand upon my thoughts about how to take social marketing to the next level. One challenge for many marketers isn’t how to get started, rather it’s how to delegate your time to make the most out of your social marketing. This series of posts will look at putting a social marketing strategy together. And where relevant, I’ll add my thoughts in terms of how PR can leverage this information for their strategies as well. Are your executives supporting you? While social marketing is being adopted by corporations, the question is whether your executives understand the value of social marketing to the business. Since results may not be immediate, you’ll want one executive sponsor who can advocate for the program and highlight the long-term benefits. What are your objectives? The tendency is to start setting up pages and accounts before fully understanding what your objectives are. Take a step back and outline what your goals are before setting up accounts. Do you have something to say? Getting started is easy. Maintaining the momentum is difficult. Do you and your company have something to say, consistently? If not, then maybe starting a blog isn’t the best venue for you but maybe slideshare.net where you can post occasional presentations and white papers. How much time do you have to dedicate to this? According to Exhibitor Media Group, 30% of marketing professionals spend 6+ hours on social marketing a week, with 10% spending 21+ hours. Do you have the time to monitor, create content and track metrics for your programs? Who’s doing the work? Ok, you’ve identified someone who has the time, but who is that person? Social marketing is an extension of your corporate brand. You need to have the right individuals in place to evangelize and steward your brand. By answering the above six questions, you can develop the right approach that fits your company and time. What other questions should one ask before pursuing a social marketing program? There has been a lot written about how to use social media and what the ROI is from using the various tool. Instead of trying to reach all audiences, I view social media as another communications avenue to expand the reach of your company’s specific audiences and customers. I originally was going to have one post but I realized this would be too long. As such, I will have a multi-part series focusing on one segment of separate tools. In this first installment, a look at microblogging. I use Twitter as my main microblogging platform, with Twhirl to manage personal and corporate accounts. Check out my previous post on Twhirl for more information. Brand awareness: Twitter is gaining traction as viable avenue for brand awareness. I anticipate seeing more company brands using Twitter as a viable communications vehicle. Similar to a website, they will need to have a Twitter handle; otherwise, we’ll start seeing “Twittersquatting” happening. Customer Engagement: Twitter is another way for your company to connect and engage with customers by following the customer’s brand, a specific department or individual for updates. This is especially true if your customers tend to be early adopters of technology. I recommend responding to appropriate tweets, especially when your company is mentioned or if people are discussing a related topic. Industry Conversations: I recommend following key individuals, such as reporters, analysts and industry luminaries, who are relevant to your company. In this way, you can keep a pulse of topics important to them and provide insight from your company’s perspective. Competitive Intelligence: Consider following individuals from competitive companies. This is one way for monitoring what competitors are doing and who they may be speaking with. Corporate Marketing: And I purposely put this last. The first tendency is to only tweet updates about what your company is doing – new webinars, white papers, etc. While this is important, you need to balance this with tweets about industry topics that would be of interest to your followers or links to interesting articles. Remember, participate in conversations. It’s not a one-way marketing channel. While microblogging is still “new” to many marketers and public relationships professionals, it is quickly becoming a de facto need like a website. 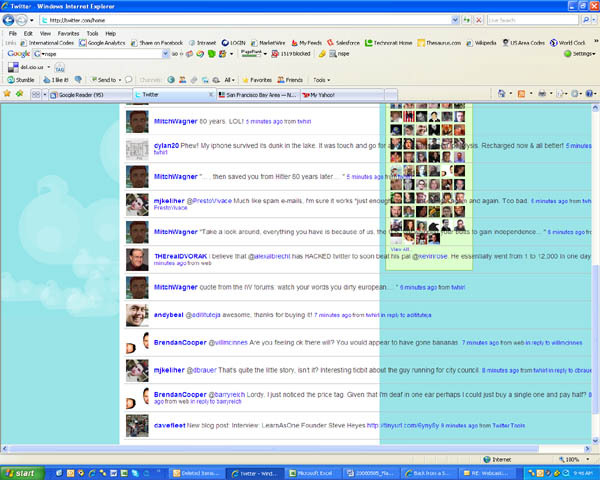 Since microblogs are bite-sized updates, a more intimate environment is created between the Twitterer and her followers. A company that engages its audiences with microblogging can further increase its brand awareness, while creating a stronger community. RT – Using social media. Part – microblogging: http://twurl.nl/rorux8. At what point will people finally get tired of all the screw ups with Twitter? Sigh.